If you lost one of your brothers or sisters, how would you remember them? Family came first for Leslie Heron Beauchamp. He grew up in Wellington in a big family where he was the youngest child and only son. His four sisters adored him and nicknamed him ‘Chummie’. Leslie shared a very special bond with one of his sisters in particular, the well known writer Katherine Mansfield. Even when Katherine moved to London, they wrote letters to each other, sharing absolutely everything. When Leslie moved to the UK to enlist in the army he stayed with Katherine a few times. The brother and sister were so happy to be reunited, but in late September 1915, Leslie’s battalion departed for France. Leslie wrote to Katherine on October 5th, telling her how well he was doing, but tragedy struck the next day when he was accidentally killed holding a faulty grenade during a training exercise. Katherine was absolutely heartbroken by the loss of her brother. While grieving she wrote some of her best and most famous work, including a poem dedicated to Leslie. 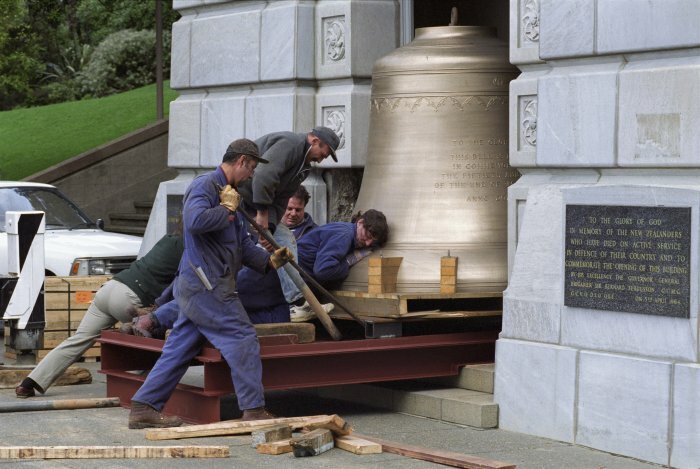 During the 1920s, his parents purchased one of the original forty-nine bells in the National War Memorial Carillon in Wellington, in memory of their youngest child and only son. When fundraising began for the National Memorial they decided it should be made massive and public to embody the scale and sacrifices of the war. Leslie’s story is just one of the many heartbreaking family stories from the war, and the Memorial Carillon serves a reminder to never forget the men and women who served and lost their lives. You have been given the programme from the commemoration of the Carillon - New Zealand's national war memorial. Leslie's family gave a bell in his name. You are now tasked with discovering more of the story behind Leslie Heron (Chummie) Beauchamp. How much of his story can you piece together? The suggestions below will help you on your research journey. The How We Find It Fact Sheet will also be a helpful tool in helping you discover the pieces of Leslie's puzzle..
Because Leslie was already living overseas he didn't serve in the New Zealand Army. Find the records that the Auckland War Memorial do hold for Leslie on Cenotaph. What date did Leslie die on? What regiment and battalion did Leslie serve with? Leslie's connection to his sister, writer Katherine Mansfield, means some papers including a telegram of condolence connected with him are held at the National Library. Can you find them? Leslie's father, Harold Beauchamp, would have had a special card delivered to him with a photo of Leslie's grave and the exact location should she ever be able to visit. Use Leslie's Service Number to search for the location of Leslie's grave. Download the Cemetery Plan and use it in conjunction with Google Maps to find his final resting place. In 1919, the government approved £100,000 for a national war memorial. Wellington citizens formed the Wellington War Memorial Carillon Society in 1926 to raise funds for the Carillon. Use Papers Past to search for Wellington War Memorial Carillon Society to see who contributed funds for individual bells. Use the Reserve Bank Calculator to convert the donated sums to 2018 dollar amounts. Discover more pieces of Leslie's puzzle. katherine mansfield wrote a beautiful poem for her only brother. "Oh I want for one moment to make our undiscovered country leap into the eyes of the old world. It must be mysterious, as though floating – it must take the breath…all must be told with a sense of mystery, a radiance, an afterglow because you, my little sun of it, are set. You have dropped over the dazzling brim of the world." Can you find the poem that Katherine Mansfield wrote upon learning of the death of her brother? Can you find the telegram leslie sent to katherine instead of saying goodbye to her? The young soldier so dreaded the moment when he had to pack up for the front that he could not bear the parting. He avoided her, and sent his sister a telegram saying "the good bye should have been too awful". 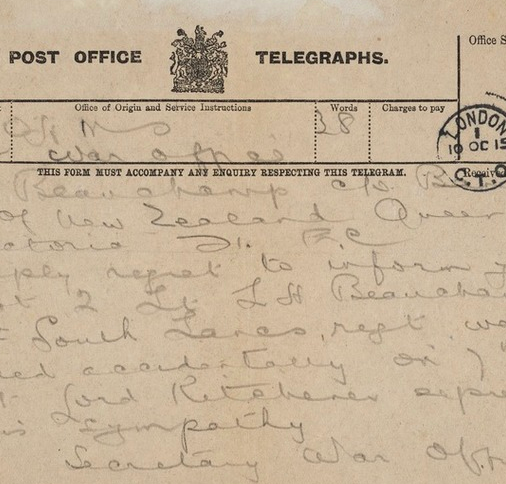 Search NZ Archives to see if you can find the telegram. what was the full inscription on leslie's carillon bell? Watch Leslie's Great War Story. What was the name of the bell that his parents purchased in his name? Use google to discover what the title means? How was the title related to the life and death of Leslie Beauchamp? Leslie's memorial bell is connected with the story of Leslie Heron (Chummie) Beauchamp who attended Fitzherbert Terrace School, Hurworth School, Wellington College and Waitaki Boys' High School. The original programme is held by Pukeahu National War Memorial Park and Blundell Bros. Ltd, Wellington #725 NAT. This story is told with the permission of Janine Renshaw-Beauchamp, on behalf of the Beauchamp Family. Prior to WW1 Leslie lived with his sister, Katherine Mansfield, in London. 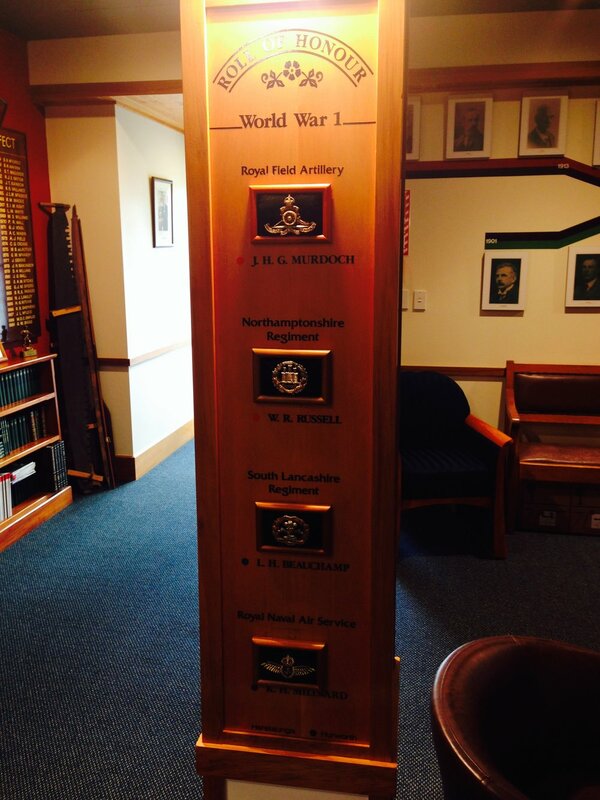 The Walking with an Anzac Team found the first clue in Leslie's story when they visited Wellington College. After visiting Hereworth School and then Waitaki Boy's High School we discovered his name on all three Rolls of Honour. Further research on the same platforms you have used today allowed us to discover Leslie's Story. Research starting points for Leslie's story. "by the remembered stream my brother stands"